Creativity is probably the hottest keyword in education in Asia in the past decade; various creative education programmes, both domain-specific and domain-general, abound. Indeed, creativity has almost become an institution against the “traditional education model” (strawman or otherwise). In this lecture, I shall share with the audience one exceedingly simple yet most effective way of fostering student creativity: by means of a blank sheet of paper. 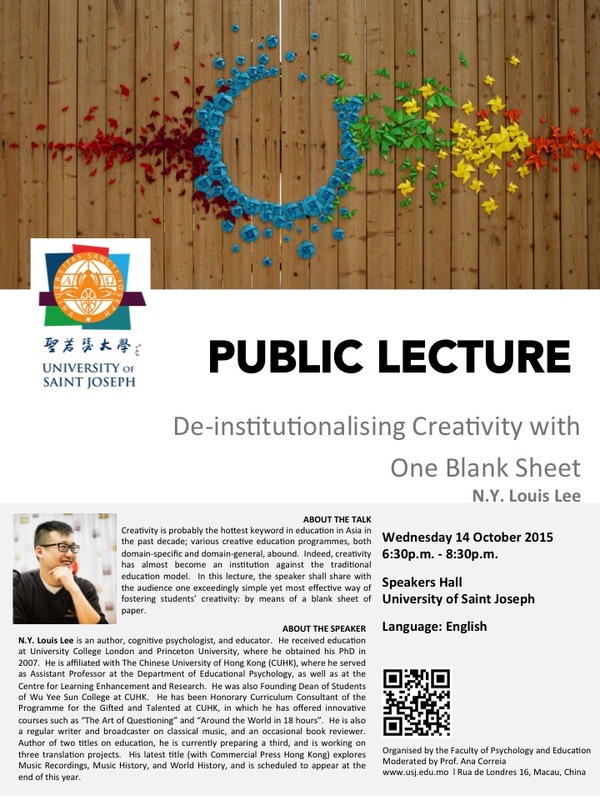 N.Y. Louis Lee is an author, cognitive psychologist, and educator. He received education at University College London and Princeton University, where he obtained is PhD in 2007. He is affiliated with The Chinese University of Hong Kong (CUHK), where he served as assistant professor in the Department of Educational Psychology, as well as at the Centre for Learning Enhancement and Research. He was also Founding Dean of Students of Wu Yee Sun College at CUHK. He has been Honorary Curriculum Consultant of the Programme for the Gifted and Talented at CUHK, in which he has offered innovative courses such as “The Art of Questioning” and “Around the World in 18 hours”. He is also a regular writer and broadcaster on classical music, and an occasional book reviewer. Author of two titles on education, he is currently preparing a third, and is working on three translation projects. His latest title (with Commercial Press Hong Kong) explores Music Recordings, Music History, and World History, and is scheduled to appear at the end of this year.